Just saying: New Hampshire has the friendliest bugs around. We don’t have the blood sucking type of bugs (unless you go pond hike). We don’t have the poisonous kinds (unless you repair cars and a brown recluse drops on you — real story, but it’s not mine to tell). We don’t have biting bugs (OK, that one is just an out-and-out lie). We just have friendly, nice to get to know you bugs. I thought I’d share a few of my favorite photos. To start you off, this little critter has been visiting our flowers. We’re lucky enough to have hummingbirds in our yard so we thought we had a tiny baby hummingbird. That was, until we got a good photo of it and saw the antenna. 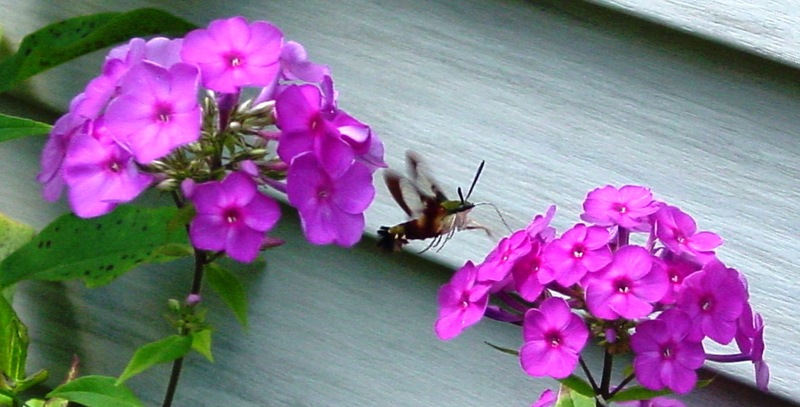 It’s called a Hummingbird Moth, otherwise known as a “Common Clearwing”. But there is nothing common about it. It is a beautiful mix of translucent and black wings; its body’s olive-green melds with muted reds, that from a distance look orange. Its tail flips down like a lobster’s tail. It moves among the flowers in the company of bumblebees and has no fear. 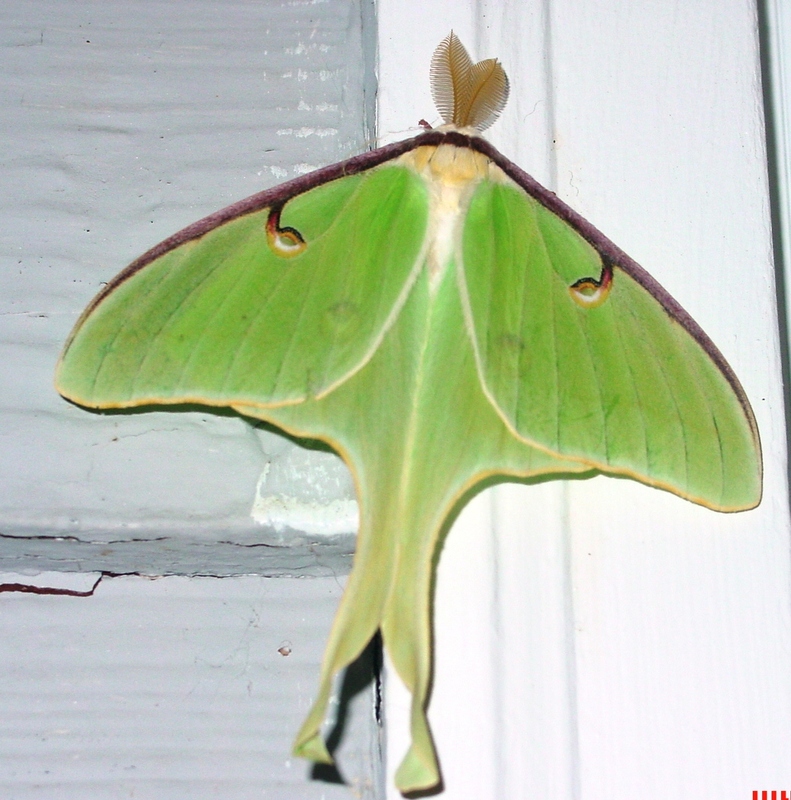 Several years ago, in the early fall, we would have a nightly visit from this Luna Moth. We would go out at night with a flashlight and if we walked around the house we would always find it. Later in the fall, when the frost was threatening and the last leaves were dangling from empty limbs, this less beautiful, but much more interesting creature hung around our house for several days. He looked like a brown leaf that, after falling from a tree, had become tangled in the screen’s mesh. I don’t know what kind of moth this guy was and have even wondered if it might be a bat posing as an insect. 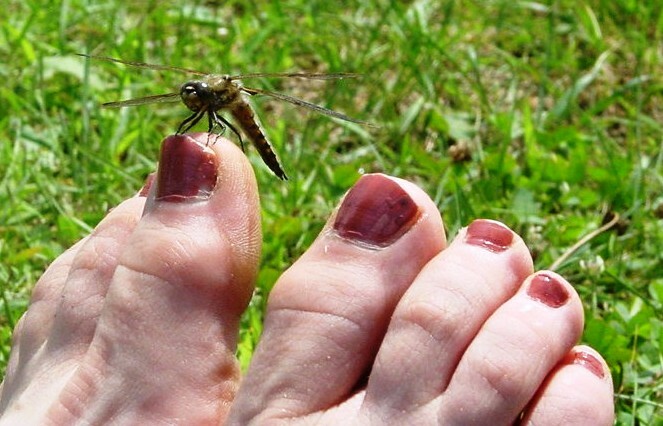 This entry was posted in Just for Fun and tagged Bugs, Cool bugs, Dragon Fly, Hummingbird Moth, Luna Moth, New Hampshire. Bookmark the permalink. Thanks for the tip. I just sent it off.